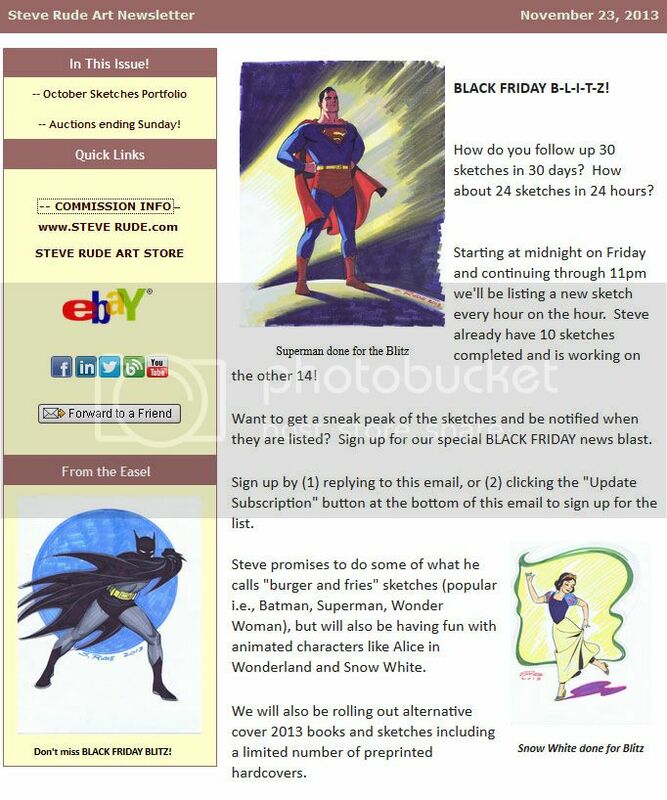 When Comic Books Ruled the Earth: Steve Rude does Black Friday the right way! I love getting these updates from the Rudes. And the Dude has been hyper-creative lately. There's a new Nexus storyline appearing in Dark Horse Presents and now this Black Friday Blitz. If you're interested, this may be your big chance to get a Batman drawn by Steve Rude. He usually refuses to draw Batman commissions. I'm seriously considering asking for a Dani Moonstar. It's pricey, but it's worth it. Edit-- Oops! Rude's not doing commissions right now because of his Nexus schedule. So that gives me time to think of something truly special to ask for when he opens his commissions list again! Although I'll happily do without as long as it means he's drawing Nexus.